“And at home by the fire, whenever you look up, there I shall be – and whenever I look up, there you shall be.” Isn’t that the essence of romantic home that every couple yearns for? When these young love birds of Piso Vilas decided to begin a new life together, they too hardly wanted anything more than this. They chose the historic port city of Vigo to be their home. With a coastline studded with charming beaches overlooking the Atlantic Ocean and the forest parks cloaking it with lush vegetation, Vigo proves to be one of the most attractive places in Spain to build a cosy nest. 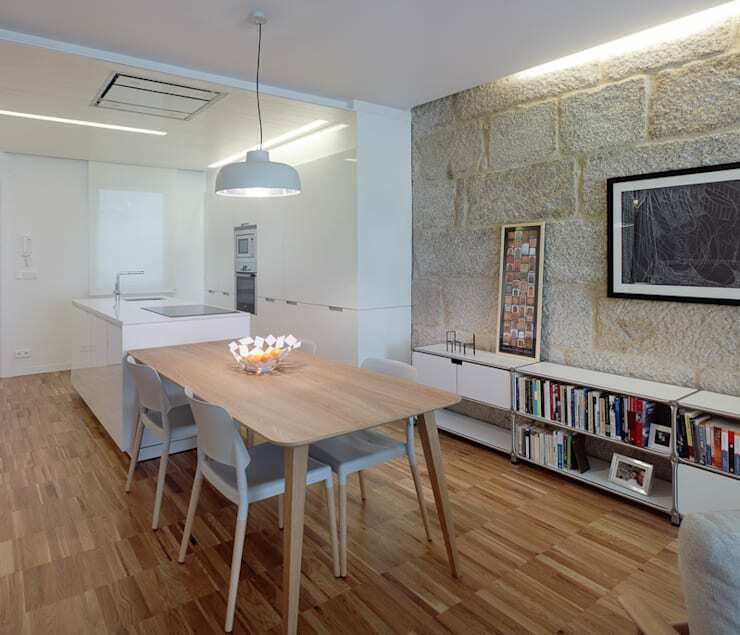 The owners chose Piso Vilas to be their new home only to discover that it required considerable remodelling to have it upgraded to a habitable space compliant with modern tastes. 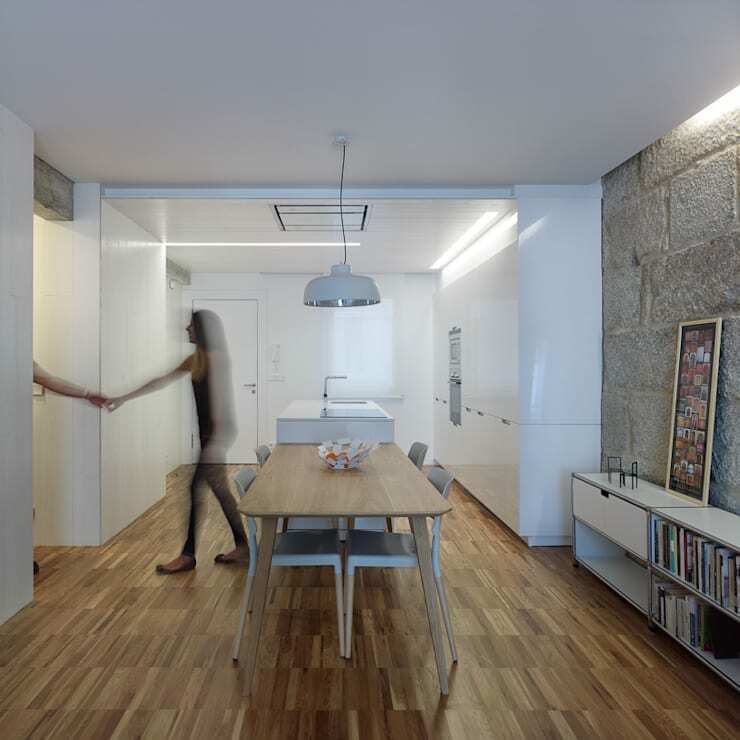 They sought the assistance of Castroferro Arquitectos and depended on their considerable experience to see it refurbished according to their requirements. The result is here for you to see and appreciate. The apartment, spread over 69 sq metres, is set on the second floor of a building constructed in 1961. Though structurally sturdy, the apartment wore the same look for more than half a century until Castroferro Arquitectos received a request for redesigning it. Before renovation, the interior received hardly any natural light. The apartment faces north and with windows opening up towards a very small courtyard, channelling the flow of light unobstructed throughout the living space turned out to be a big challenge. Eventually, with the exception of one, all the interior walls were brought down, the clutter cleared up and gracefully decorated to create a space that brightens up the prospects of conjugal felicity in its comfortable surrounding. 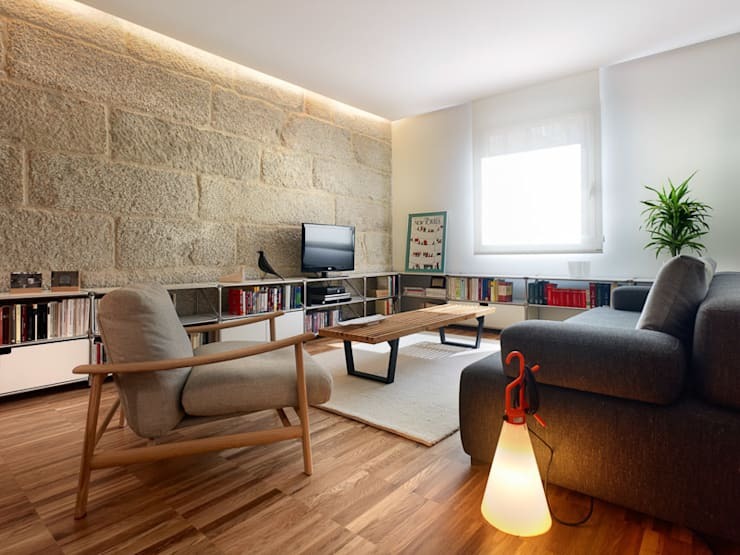 The strong visual appeal of the exposed stone wall, standing in the middle of the apartment, adds character to this free flowing living room. It seems almost a reminiscent to the city’s past when stone buildings used to be a prominent feature. The severity of the rocky surface, if any, is duly tempered with the delicate nature of parquet floor made of industrial quality oak. The other walls, washed in white, wear a suitably neutral look. Storage units and book shelves cover the skirting. A basalt grey sofa holds a central position. It is accompanied by a cosy armchair and rather oblong bench like centre table. The other end of this long hall is reserved for the kitchen. Once again the parquet floor immediately draws everyone’s attention. Nearly ceiling high cabinets, worktop and kitchen island possess a pure white look which helps in giving the space an expansive feel. Cutting edge white lacquered pine wood ceiling exudes a refreshing charm. Additionally, it reduces any creeping sense of clutter. It is attached to the open plan kitchen and occupies one of the loci of this free flowing hall. The sleek wood top table is flanked by four chairs of pale grey tone. 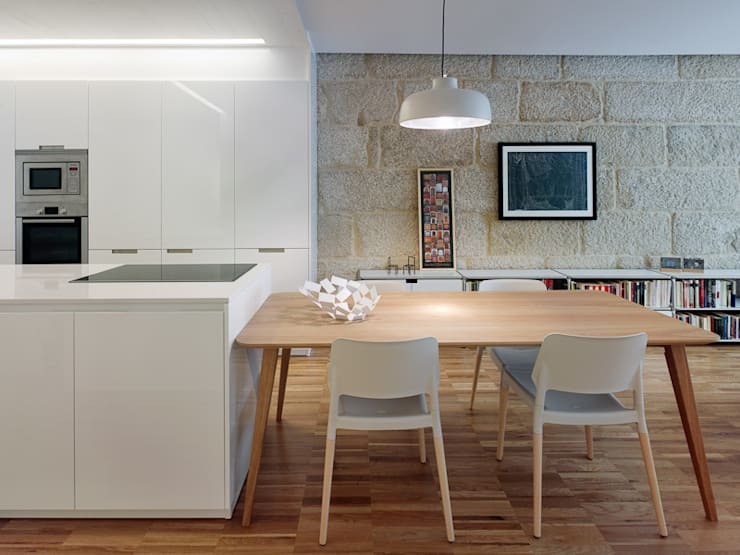 A suitably modest pendant and ambient lighting brighten up the space. The entire hall is decked with numerous artworks, including a stylish fruit bowl. 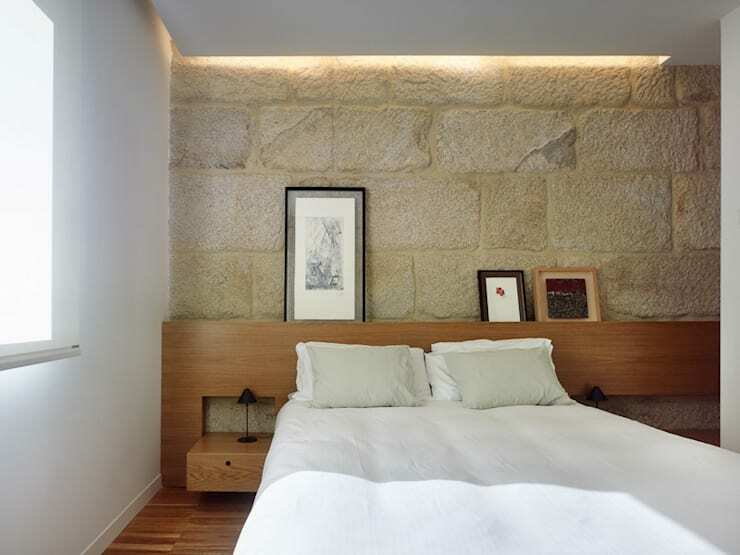 The bare stone wall looks eye grabbing in the private quarters too. Wooden floor and headboards with adjacent drawers give the entire space a chic makeover. Light from tiny table lamps, ceiling mounted fixtures and window cheer up the room. The bed is modest in looks but cosy and comfortable still. With everything else being white, the onus of augmenting the warmth lies on the wooden elements of the room. Though, their job becomes easy with the deep bonds of love and friendship between the occupants of the room. 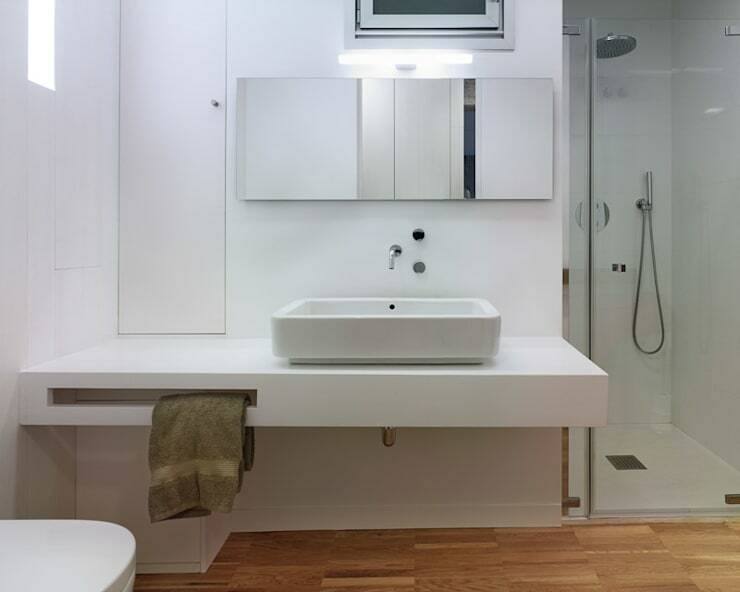 With the exception of the parquet flooring the bathroom boasts of same pure white look and stylish finish. Given the space constraints, the storage units have been kept minimal. Large mirror helps to open up the space a bit. Clever opening for light does the rest. Have a look at some of our other ingenuous refurbishment ideas of a small apartment here.